The UK department store, Marks & Spencer, has reported on the results and findings of its first item-level RFID technology trial on a selection of men’s suits, shirts, and ties at its High Wycombe branch from October 13th to November 7th, 2003. Consequently, the company has announced a second, much wider trial. Marks & Spencer has concluded its first trial of RFID (radio frequency identification) tagging within its supply chain and stores, using electronic item numbers unique to each individual product item (unlike barcodes and EPC tags, which are unique only to a product line). The four-week High Wycombe trial had two purposes: to test the technology and to test levels of customer acceptance. To the relief of many consumer privacy activists, the RFID tags developed for the garment trial were contained in throwaway paper labels. They were trialled to test their ability to enable Marks & Spencer to check stock deliveries, and count stock quickly in stores and depots. Scanned information was transmitted to the central stock database where an automatic comparison with the stock profile for the store triggered replenishment orders where necessary. While the technology test was generally successful, it also highlighted a need to modify the hardware and software before any larger scale implementation could be practically undertaken. Two types of scanner were developed for the trial. One was a ‘portal’ installed at the distribution centre and the loading bay of the store to allow rails of hanging garments and trolleys (called totes) containing packaged garments, to be pushed through and read at speed. The other was a mobile scanner housed in a shopping trolley with a hand-held reader, which was used to scan labels when garments were placed in the store itself. The portal was found to provide a less accurate read than the mobile scanner and was obviously less versatile. The PC integrated into to the scanner needs to be ‘ruggedised’ – contained within a more robust casing with a smaller screen. The wheels on the trolley need to be enlarged to increase mobility. In a move to reduce the level of power consumption and size of battery, the role of the scanner will be changed to that of a transmitter rather than a processor of information. Customers did not have spontaneous awareness of, or issues with, RFID technology (in fact, only one customer noticed the label without prompting). The issue of the need to improve stock control was regarded as being internal to Marks & Spencer. Taken together, the name of the label (it was called an ‘Intelligent Label’ during the trial), the symbol on the label, and the explanatory wording were variously interpreted as suggesting, for example, a security role or a reference to fabric information. While the customer leaflet provided during the trial was regarded as explaining the purpose of the label, it also seen as contradictory in stating that there was no requirement for the customer to retain the label for refund/return purposes. The points raised by customers will be addressed in the redesign of the label and a new customer leaflet will be issued for use in the next trial. The modifications being made to the mobile scanner and software as a result of the trial will have to be tested. Additionally, in order to establish whether there is a business case for the introduction of RFID in any part of the garment supply chain at item level, a more extensive trial involving a number of stores will be required. While plans for such a business case trial are still being developed, it is thought likely that the second trial could begin in spring 2004. At the time of a further trial customers would again be provided with information on the company’s use of RFID technology, their privacy, the throwaway label, and how it does not affect refunds and returns. Marks & Spencer’s goal is 100% stock accuracy, which will enable the existing distribution chain to maximise its efficiency. Customers would therefore benefit from better availability of the goods they want each time they shop. In order that the chips could be small and relatively inexpensive, the RFID tags for throwaway garment labels were designed to hold very limited information – purely a number that is unique to each garment. 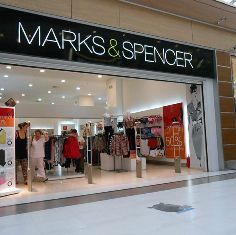 The information associated with the unique number was held in Marks & Spencer’s secure database, and related only to that product or garment’s details, for example, the size, style, colour. This information was not, however, tied to the purchaser’s identity in any way, as the tag was not scanned at the check-out and therefore, irrespective of the method of payment, no association could be made between the item and the purchaser. All of the RFID tags used in the trial were passive (having no battery), meaning that they could only release their unique identification number when passed by an official Marks & Spencer scanner. The tags (microchip and aerial) for garments were contained within paper labels which were attached to the garment alongside a separate pricing label. This Intelligent Label was designed to be cut off the garment after purchase and thrown away. In the case of shirts, which are sold pre-packed, the tag was stuck onto the transparent shirt bag. Each store has its own product profile or ‘catalogue’ and this information is used to generate stock deliveries from the distribution centre. To ensure that each delivery is accurate, the order is checked as it passes through the portal before despatch, at which point the goods are scanned. To ensure that the lorry delivers the correct order to each store, the delivery is read again as it is passed through the portal in each store’s loading bay. Each evening, after the store has closed, staff take the mobile scanner onto the shop floor to read the stock remaining following the day’s trading. This information is transmitted directly back to Marks & Spencer’s stock management system to ensure that accurate replenishment instructions are issued overnight to the distribution centre, enabling the store to be fully re-stocked for the following day. The scanners operate at frequencies and power levels permitted for RFID radio signals in Europe, which are around eight times lower than those used in the USA. This means that the maximum accurate read range attainable is around 50cm. The tags trialled operated on 868MHz for clothing, and 13.56MHz for food trays. The Intelligent Label project was partly funded by the UK Department of Trade and Industry (DTI) and made use of expertise from Paxar and Dewhirst. The scanner technology was developed in conjunction with Intellident Ltd, with SAMSys Technologies Inc. supplying the readers. The microchips for the tags were developed by EM Microelectronic of Switzerland.